Today’s guest post comes from Jeanne Grunert from Seven Oaks. She spent most of her career as a marketing executive in New York City. In 2005, her and her husband bought a 17 acre former timber farm in Virginia. Two years later they had 3 acres cleared for their house and garden. They have a 30 acre fruit tree orchard now along with a large vegetable garden. She’s now a writer, focusing on gardening books, including Get Your Hands Dirty and How to Attract Birds to the Garden. After a fun yet exhausting Sunday afternoon canning, my husband and I decided to tally up all the vegetables I had dried, canned and frozen this year – and put into the basement for storage. All of these vegetables were grown using 100% organic gardening methods. I am estimating everything; please understand that this in not a scientific, mathematically accurate estimate. 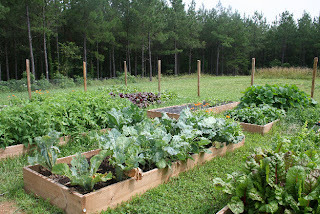 It’s just an example to show you the amazing power of growing and preserving your own vegetables. That’s the 2011 tally to date, as of October 1. Despite the cool night time temperatures, I still have peppers in the garden, tomatoes, winter squash (acorn and butternut), plenty of carrots, parsnips, turnips and eggplant left. That estimate doesn’t include all the fresh vegetables we have consumed since planting the garden this year and the potential cost savings there. Now we looked at the expenses. We did NOT include the cost of the canning jars and freezer containers. Why? Because these things can be used year after year until they break, so there are an unknown number of times of use out of them. The only cost is replacement seal lids, which are $2 for a package of 12, and that’s negligible. I also did not include costs of vinegar, sugar and spices used to pickle and can the food. An investment of $25 yielded for me $100 in organic vegetables. No special equipment…after planting the vegetable seeds, the only time I spent is tying and staking tomatoes, thinning vegetable plants, and harvesting potatoes (which was more labor intensive than I’d thought it would be). All of the vegetables were grown organically, so I am guessing that buying the organic equivalent at the store would be more expensive than the conventional brands. Not only do I know precisely WHAT is in my food, I have grown it all less than 30 feet from my house in a backyard garden. Instead of fossil fuels burned trucking it from California, Florida, and other parts of the country, by growing my own food I have reduced some of that burden from the environment. You might not have the space that I do to grow vegetables. But you can really grow quite a lot in small spaces. My dad grew many vegetables in a tiny area in our yard; when I moved to another house on Long Island, we had dense shade in the yard and only some direct sunshine onto a patio and deck, so I planted tomatoes, peppers and many other veggies in pots on the desk. You CAN grow vegetables no matter where you are. 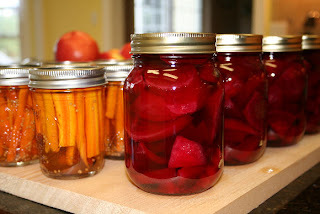 In the fall of 2008, I wrote on this blog about my first efforts at canning. I was so afraid to try it. I was afraid I would do it wrong and poison my family. Now I feel confident with the hot water bath canner – so confident that I have asked for a pressure canner for Christmas! With the pressure canner, I can can garden vegetables without pickling them. We harvested our first fruit from the orchard this year – one pear, and about six peaches. When we planted the fruit orchard trees in 2008, we read that it might take up to 5 – 10 years, depending on the trees, before we saw some fruit. Once those trees begin producing abundantly, I will be able to dry and can that fruit too. I was born and raised in the big city. I grew up on Long Island, and worked most of my career in New York City. Canning was foreign to me. It was a skill only one generation removed; my grandmother canned her garden produce and canned sauces and soups, but she moved when I was 8 and died a few years later, and I never had the chance to learn from her. As I lay down to sleep last night, it wasn’t the thought of saving money that made me smile. It was the thought of self sufficiently. There is a deep, strong appeal to me of the thought that I am beholden to no one for me food. I can grow it and preserve it on my own. If at some point we decide to raise some chickens and other animals, we can reduce our dependency even further. It’s definitely a lifestyle choice, but if self-sufficient living appeals to you, I urge you to try whatever you can in your little corner of the world. When I lived in the equivalent of a big city, I grew vegetables in pots on the deck. I started small with my canning projects and now I can can close to 20 pints in one day and feel confident about it. Each time you try something, you’ll learn.